It all began with two sisters going on a road trip. Back in 2014, Bev Prout and her sister were on a quilting “Shop Hop”. After a couple of hours they started to run out of steam (and money) for shopping and started noticing the beautiful wooden quilt patterns hanging on various barns. As luck would have it, they were on the Longwoods Barn Quilt Trail in Middlesex County. Having heard about Barn Quilts a few years earlier Bev’s interest was piqued as they continued following the trail, observing the beautiful Barn Quilts along the way. 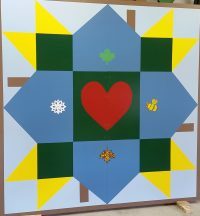 The idea for Barn Quilt Trails is credited to Donna Sue Groves and was launched in Adams County, Ohio in 2001. Barn quilts are typically eight foot squares of wood painted in a quilt pattern. Designs are either selected from existing quilt patterns or original patterns designed by the owners. They are usually hung on barns or posts. Each quilt tells a story and is representative of the families who create them. A quilt trail displays the heritage and landscape of each area in which its found. For instance, Bev’s own barn quilt represents four generations of Prouts, their four daughters, and the four seasons of the year. The trail concept was adopted by the CiB and members got to work. Working through the Heritage Committee, letters were sent out to Heritage Farm Owners inviting them to participate. A notice was put in the local newspaper and on the CiB facebook page seeking interested persons. A display was presented at the Home and Garden Show in Exeter. A grant obtained from Canada 150, distributed through the Grand Bend Community Foundation, provided funding for the purchase of 12 boards. These were distributed to the first 12 people who were ready to start. Bev, along with her husband, Tom, hosted workshops (technically painting parties) and so began the start of the South Huron Quilt Trail. A Trail Guide was put together by the summer of 2017. South Huron Communities in Bloom also worked with the International Plowing Match (IPM) in promoting their quilt trail, the Huron County Trail, for Canada’s 150th anniversary. 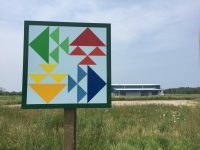 South Huron now has 32 barn quilts with several more in the making. Let dry for about a week, then seal with two coats of sealant. South Huron Communities in Bloom continues to promote the Barn Quilt Trail. If you have questions or would like to get involved contact shbqtrail@gmail.com.